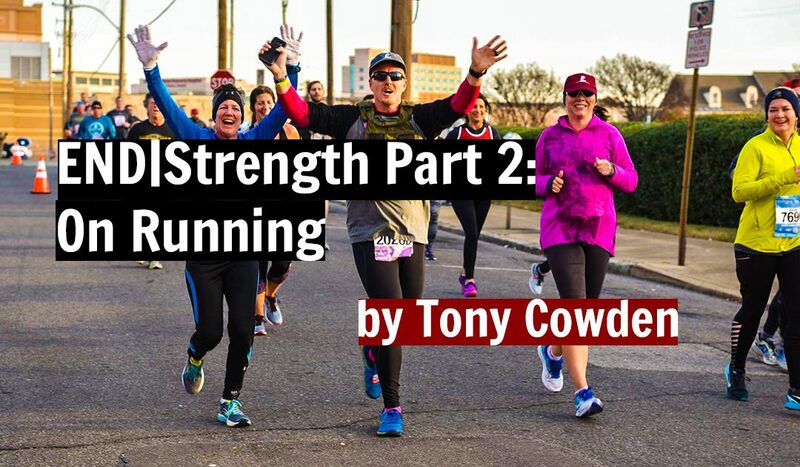 Tony Cowden has helped lead the way in developing hybrid endurance and strength athletes, especially within the military. His END|Strength™ Programming develops high levels of endurance and strength simultaneously and has become the go-to of the US military special operations personnel as well as athletes looking for new challenges. You can follow Tony or sign up for his programs here. As we discussed in Part 1, developing respectable levels of strength and endurance concurrently can be done. More and more strong guys want to be able to get outside and be active. Conversely, endurance athletes are recognizing the benefits of being stronger. Sadly, when most of either attempt to add work to their already taxing training programs, they quickly become frustrated, overtrained, and ultimately forego whichever they are least comfortable with. When most athletes add running to their strength program, or strength work to their running programs, they do not reduce their current volume and/or intensity. The trick to running and strength training concurrently is consider how to best pair strength and endurance training to balance the stimuli with the proper amount of recovery. Running is the most fundamental, natural, and useful movement humans can do. Not to worry, this is not where I write some bull sh*t anecdote about running to evade a large, pissed off predator… that mess is just dumb. But since most people do not run much after the age of 10 years old, we nearly completely lose the ability to it well. Beginning a running programming as an adult is actually pretty easy… almost too easy. Specialty running stores are in every mid-sized city in the US, there are quite a few good magazines on it, and tons of info on the internet from excellent sources. Yet, even with all the great info available, most newbies go about it all wrong. In contrast to the average person who takes up strength training, where it is standard to hire a coach to teach them proper and safe technique, the majority of new runners simply purchase a pair of running shoes, download a zero to hero run program off the internet, and take off. I suggest these basic guidelines to anyone new to a sport. The next thing you need is a pair of running shoes. Again, sounds simple, but if you Google search “choosing a running shoe” you will get a ton of differing information. Most advice, whether it be professional or from a Bro, is centered around gait and/or pronation. Gait is movement, more specifically, running gait is how we move when running. Pronation is how much the foot rolls inward and arch flattens under load. Many suggest gait analysis at a local store. I don’t hold much stock in this type of gait test. My experience with it has been the shoe the test suggests do not work for me at all. I overpronate quite horribly, but favor a neutral running shoe over the recommended stability shoe.. This is pretty common. These tests are usually videos of the feet and not the entire body. An untrained runner who has not developed a solid technique, these test may offer even less. Full body gait tests are regarded as superior, but are more difficult to find. So ultimately I suggest purchasing the most comfortable pair shoes. It is a simple approach, but tends to work for most new runners. As you develop and improve, you will learn what you need… but keep in mind, as you develop and improve, your needs will most likely change. So what about cushioning? The minimal movement is all but about done and over. I ran in minimalist shoes… no, not those stupid looking five “fingers” (toes??) shoes. I just couldn’t. I wore Inov-8s. I still wear Inov-8s… for some GPP and just walking around. In 2012 I did a half distance IronMan Tri with no specific training or prep for it. After the 13.1 mile run in Inov-8s my feet and legs were sore as hell. Enter the max cushioned shoes of Altra and Hoka One One. At first look I thought they were the ugliest thing ever made…. way worse than five fingers. And the fact is, they are the ugliest running shoes ever made. But then I put a pair on and now I don’t run in anything else. Since, I’ve trained for numerous long distance events in both Altra and Hoka shoes. After a slip at the water exit of the 2014 Beach 2 Battleship Iron Distance Tri, I ran the marathon portion of the race with a broken second metatarsal in Altras. Painful, hell yes… but I doubt I would have finished if not wearing them. I used to recommend them for bigger, heavier runners. Now I recommend them to all runners, especially those who are going to be struggling to manage the recovery of both lifting and running. My lightest END|Strength athlete, Melissa Hoff, tips the scale at 125lbs is also a former minimalist and she too enjoys the reduced trauma and increased recovery of running in max cushioned shoes. As far as programming goes, the first thing we have to have is a goal. It should be obvious that the training program for a half marathon differs from that of a 5k. A program for maxing out a 1 mile should be different than one that meant only to improve overall health. I said it should be obvious, but sadly many runners train the same for a long distance run as they would for a 5k. In the last 8-10 years, many runners have tried to subscribe to a “sprints for endurance” type of programming. Like the minimalist shoes, this type of training is losing its popularity, even in the “functional fitness” world. Human physiology simply does not support this approach to endurance training. I tried it. There is no way to build an endurance or aerobic base without completing endurance and aerobic training. So once the goal is established, we can set up a program. The most important thing to note is a both strength and endurance volumes must be decreased from the typical levels the average strength and running programs prescribe. Simply combining a strength program and running program will quickly lead to over-reaching. A common goal I have trained folks for is increased strength and improved 1 mile time. These two are very easy to develop simultaneously. The mile, and the training required to improve it, does not require distances and volumes that interfere with developing strength. In some cases, I have seen it bolster strength gains. As our running goals get longer in distance and faster paced, developing strength becomes more difficult. If the goal is to get stronger while training to “complete” a half marathon, we can do that fairly easily. If the goal is to get stronger and run a half marathon in 1 hour and 30 minutes or less… well, let’s just say we are going to have to compromise on the strength portion quite a bit. It is give and take. With so many consideration and variables, you would think it difficult to program for so many differing factors. Not really. It much simpler than you think. Since intensity is inverse to volume, we build out a week of programming to maximize on this fact and also couple the appropriate running training with the appropriate strength training. It typically places running and lower days together. Again, it is all up to the goal, but a typical week of programming for a person whose goal is to do the best they can on a half-marathon while concurrently developing their strength looks like the below. *This is a basic example. It is not off season or pre-contest / pre-race either. **I keep my athletes to a 2 week training, 1 week reload (deload) schedule. Keeping the program simple is crucial. It has been the trend in strength training over the past 10 years for programming to be more complex than trigonometry. A program needn’t be complex to be effective, and that is most certainly the case with hybrid. In fact, the opposite is true. An effective program, no matter the discipline, includes only what an athlete needs. For END|Strength hybrid work that is typically a major lift, only the accessory work the individual needs, and volume at levels much lower than most would expect, The biggest thing I try to convey to athletes interested in END|Strength training is the increased time commitment. While the program will have less lifting than conventional lifting programs and less running than conventional running programs, the combination of both still nets an increase is time you will need to dedicate to your training. Of course the longer the distance of your goal run or race, the more time it will take. The most important take away are the below. Again, they apply to beginning any sport.